Growing potatoes must qualify as one of the vegetable gardener’s favorite pursuits. I’d guess that it’s one of the first vegetables that new gardeners go for, even if only in a couple of buckets. Digging for potatoes, however, is less popular, especially among those of us with bad backs. In fact, I gave up growing them altogether at one point, purely because I wanted to stand upright for the rest of the year. If you suffer the same problem, then no-dig potatoes are the answer, but the advantages aren’t all back-related. It’s also easier to judge when the early varieties – those harvested while the plants are still in flower – are ready. Over-enthusiasm used to mean that I had at least one meal with potatoes barely larger than peas. Disadvantages? Well, it’s not advisable to grow spuds this way too early in the season, as their light covering makes frost more of a threat. Some say that slugs are more of a problem, but it’s worth noting that the mulch encourages predators such as amphibians and beetles. It’s also possible that the potatoes might need a bit more watering, and yield will probably be slightly smaller than it would be from an underground crop. In my experience, though, the difference is small enough not to matter. Charles Dowding, who’s been using the no-dig method to produce vegetables for market for nearly thirty years, is something of a no-dig guru here in the UK. Potatoes are, in his opinion, the only vegetable that like to grow in, as he says, "mechanically loosened soil" and consequently he tends to put them in after parsnips which need a bit of a hand to help them out of the ground. Hoe off the area where you want to grow your potatoes. Most weeds would die off anyway under the heavy mulch, but this is a good way to ensure that the surface of the soil is loose. You could also add a layer of compost on top. "Plant" your potatoes by placing them on the surface. Spacing is the same as normal planting, so early varieties in a bed system should lie 14-16 inches (35-40 cms) apart in every direction (in rows you should allow around 12 inches (30 cms) between plants and 18-20 inches (45-50 cms)). Maincrop varieties need around 18 inches (45 cms) in every direction in a bed, or 14 inches (35 cms) between plants in rows 30 inches (75 cms) apart. Now cover. You could cover with a couple of inches of compost, but I go straight to the straw. Some people like to top it up gradually as the shoots grow. Being a lazy gardener, I put on six-inches (15 cms) straight away. After all, they’d be six inches under the ground if you did bury them. Water the straw well. One thing about growing potatoes this way is that they tend to dry out more easily, so getting everything damp now is a good start. Of course, straw being straw, and the wind being a pain, you can’t just leave it. Either tether it down by covering with mesh or fleece, or cover with grass clippings. I tend to use the mesh to begin with. The plants make their way pretty easily through the straw and then I can see them pushing up against the material. Remove the mesh when the plants emerge and, if any plants are being held back by the mulch, help them through it. You could continue to add straw but grass clippings are better. They mat together in a way that solves the wind-blown straw problem and a thick layer excludes the light very effectively. If they’re fresh clippings don’t cosy them right up to the stems immediately, in case the heat of decomposition burns the stems. Now all you have to do is water when necessary and top up with grass clippings if the mulch looks a bit thin. Harvest when ready. Here’s where no-dig is really useful, as you can check the crop without wasting a plant. Just draw back the mulch. If the potatoes are too small, replace the covering carefully and let them grow on a bit longer. You can even harvest some potatoes from a plant and leave the others to grow on. "straw is expensive here does hay work as well ?" "Helen, Over the past four years I have grown different varieties of potatoes using different "no dig" methods: all with poor results. It was very disappointing. Some of the plants barely produced potatoes of any size at all...a few produced tiny HOLLOW potato skins with no flesh inside!!! Some were planted in grow bags, some in large trash containers (clean ones!) and some under mulch...none of which produced well. This season I have reverted to the tried-and-true old hard work method of digging them in and hilling...we'll see what happens. I enjoy reading the posts and seeing what other gardeners are trying. Good to know there are so many of us happy "dirt mavens" putting forth the effort to grow something delicious. Suburban Farm Woman in Virginia"
"Could you use sugarcane mulch as this is abundant here?" "Hi, Suburban Farm Woman - sorry to hear the trouble you've had with no-dig potatoes. I wonder if the common factor was water - bags and containers do need to be kept well watered. Yes, ML, hay is fine, but you might find a few more seeds in it that go on to produce weeds. As you can imagine, Mark, sugar cane mulch isn't something we get much of here in the UK. However, a scout around tells me that the coarser stuff tends to work best, as some people find that fine sugar cane mats down into a layer that doesn't let water through. Also, be careful of your source, as a lot of it has been treated with chemicals. For anyone who wants to see what sugar cane mulch is like, Rocky Point Mulching has a video of how to use their product: http://www.rpmulching.com.au/"
"We've been growing our potatoes using this method for over 20 years with great results most of the time. We did have some problems with one location and discovered water had a tendency to not drain quickly. Potatoes do not like wet feet!!! D have you done a soil test on the areas you are trying to grow your potatoes? What you're describing is usually a result of inadequate nutritional elements and/or the ph is off. Potatoes prefer a pH of about 5 to 5.5 pH, which is slightly acidic. I suggest you test and then make adjustments accordingly. Because we garden using organic methods, we use both compost and worm castings as our fertilizer with excellent results. " "We are using some dirt but mostly oak leaves since they are usually acidic. Hope it works!!!" "I'm so glad to run into this article on Facebook! (Thanks Humble Seed!) I've been getting more and more exasperated because for some inexplicable reason the stores in my area this year rarely have any potatoes. Why is that? Is there some sort of earthwide shortage of organic red potatoes? So, I'd decided I'll just grow my own this summer. Your timing was perfect. Thanks~"
"Thanks for writing this article! It's timely for me too. I'm growing red potatoes in shallow soil with pine needle clippings nice to know that there are other options like Oak leaves and straw, thanks for the comments;) I tried to grow potatoes in a large planter last year but my yield was 5 small fingerling sized potatoes:( They were still yummy though :) "
"This is for Helen Gazeley. Read your article on potatoes, wanted to know if this will work for sweet potatoes? I have ten Sweet Potato plants coming in a couple of weeks. Thanks, enjoy your articles. " "Be sure to keep adding more of whatever mulch you're using as the season continues. As you're plants are growing higher keep bundling more up around them so they keep making more potatoes. if you're not doing so, then they will only grow a few potatoes and stop. We've used the straw method for a few summers now in a raised bed with success. this year we're trying in bags hopefully with the same success." "I tried growing potatoes in a large clean trash barrel using lots of straw mixed with soil. The end result was so disappointing. All the energy went into large green plants but I only harvested the same size and number of potatoes I planted. I am going to try this year growing them in a bale of straw and see what happens." "Can you do this with carrots? I know that you would have to make sure the compost is fine and deep enough to prevent forking or other odd shaping, but it would sure be great as far as ease of harvesting." "Kim, this definitely isn't for carrots. Carrots will always grow down into the soil, so wouldn't lie around in an easily harvestable manner on top, and a tiny carrot seed in amongst straw would get washed away and buried. Larry, sorry for the delay in replying. Sweet potatoes are a different plant from the normal potato and are grown from slips, or unrooted cuttings, which have to be planted. If you have a sprouting sweet potato that's turned up at the greengrocer's, then by all means give it a go, but general opinion is that it won't produce well, if at all. " "Normally at lot of veggies you get from the store have been treated with chemicals to increase their shelf life. So they don't always do to well, but it's certainly worth a try. To get more slips, you can cut a sweet potato in half. Stick 3 toothpicks in it, set it in glass jar in a warm spot and let it go. Sweet potatoes actually make very attractive houseplants done this way. Hope that helps. " "This is my method. I grow my spuds on raised beds. This makes for free drainage and not being waterlogged. It does mean that you have to keep your eye on watering in dry periods. Firstly I put down 4" of well rotted manure/compost. The spuds go directly onto the manure. They are then covered with 4" more of manure/compost then 4" of straw. The bed is then well watered. As soon as shoots emerge, cover them with 4" of more straw to stop any frosts attacking them. At this stage I cover them with spent hops, that are usually given away by local breweries, if there is one in your local area. A further covering of straw or hops will be required depending on maturity. First's require one covering, Seconds and Main require at least two coverings and maybe three for very late spuds." "We have successfully grown potatoes using this method for many years. One of the "tricks" to getting a bountiful harvest is to make sure the soil is rich in organic material. Potatoes are fairly heavy feeders and need those extra nutrients to produce bud. I wish we had access to those hops, Chuffa. However, we are vermicomposters, so we periodically spray down the plants poking thru the straw with worm casting tea and then cover with more straw. For heaven's sake, use builder's straw, not hay. Builder's straw has a lot less weed seed. " "Great article. I just planted red potatoes on he ground, covered them with about thee inches of compost, then added the straw. I hope it works in Oklahoma." "I've grown no-dig potatoes for years by building a raised garden bed with walls of small hay bales on their edge, putting my seed potatoes in the centre, covering with compost and manures then more hay or straw.I then keep adding to the pile till its as high as the hay bales or till the plants flower and die down.Then I pull the lot apart to get at the spuds, and dig over the resultant organic soil mix for another crop of root veg like carrots or beets. 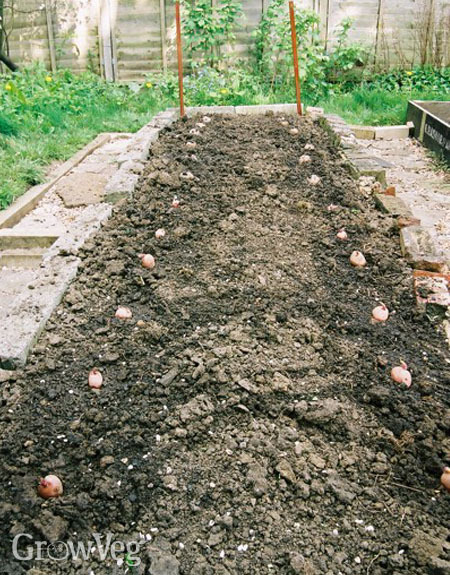 A good way to prepare virgin ground for future veg gardens "
"Hi, could you use a weed membrane in the ground to stop eelworm from attacking potatoes and would jeyes fluid help in eliminating the little blighters?" "I'm growing several different varieties of potatoes using the straw method as an experiment. I keep adding straw as the green stems and leaves pop through. Five weeks into this, the straw is now better than 2 feet thick and reasonably well packed and the green growth continues like gang-busters. When do I quit adding straw and just let nature take its course?" "I will second Mason's questions. I have very tall plants and I am wondering when I should stop piling straw or grass. " "as long as the plants are happy and healthy, they will continue growing roots and potatoes. they will only get maybe 3 or 4 feet high at the most and they will also start to flower, and then finally they will start looking limp. you can at any point peel back some straw and harvest the smaller New Potatoes, replace the straw and allow other potatoes to get bigger. 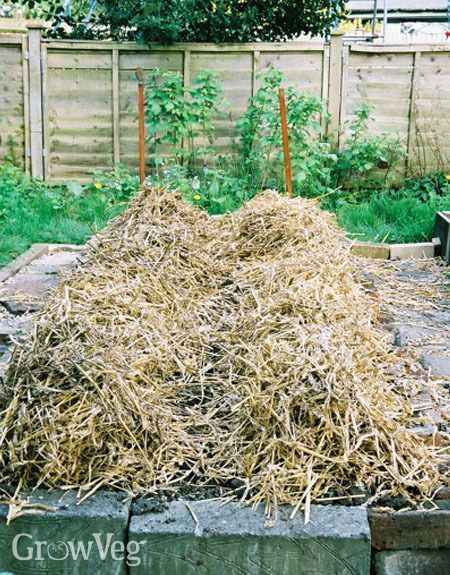 if you have extra compost around I'd add that in your next layer of straw. just to update my post last spring, the bags didn't work (too much light came in through them) so I'm back to raised beds." "Darren and Mason, you can stop piling the straw now. You only really needed to cover the potatoes and ensure that the light doesn't penetrate. Two feet is deep, and research has shown that it's highly unlikely that you'll have potatoes anywhere but in the layer where you originally planted them. Natalie, good to have the update, thank you. " "Thank you Helen and Natalie. I grew up hilling potatoes so this method really appealed to me, especially since I too use raised beds. " "Thank you for this wonderful article , I shall be trying this method out for my next batch of potatoes , the early ones are at the moment in the hall awaiting sprouts , I will let you know how I get on , living in the west of Ireland here can you suggest a time to put in the no dig potatoes , when can I be sure there is no danger of frost ." "We are trying really hard to sort out our site here , there is a lot of tough grass in gigantic tufts , we have been making no dig beds with cardboard , compost , straw and more compost but some of the grass clumps are so high I wonder will they ever break down, I was wondering should we grow green manure seed on some of the beds if you have time could you let me know the best way to break down this scutch grass my mom used to call it , if you tug at some of it there is a lovely dark moist soil underneath, my husband was wondering if large rolls of cardboard are available anywhere if only to give us somewhere to walk and wheel the barrow on, I spend a lot of time looking for the correct recipe maybe you have one. The article here on the spuds is great and really gives a wonderful step by step by guide thank you for sharing this. Kind regards Kathy." "Hi Kathy. Not sure when your last frost date would be, but I would suggest you are probably okay to plant from early to mid April in the west of Ireland - so long as you are on hand to cover up the shoots with fleece or similar if a frost is forecast. With regards clearing the grass, one way is as you are doing - to cover with layers of cardboard, topping up as they rot down (about every two months). You can find cardboard in recycling centres/dumps. Alternatively - and this may be easier with really tufty grass - cover the area over with black polythene or any other light-excluding sheet. This will deprive the grass of light and moisture, which will ultimately kill it off or weaken it to the point that digging it out is easier. If you are able, add some compost or manure beneath the mulch so the worms can work on it while the grass is being choked off. Good luck!" "Ben and Kathy, I have some reservations about your suggestion here: "cover the area over with black polythene or any other light-excluding sheet. This will deprive the grass of light and moisture," and "cover the area over with black polythene or any other light-excluding sheet. This will deprive the grass of light and moisture," Black plastic will kill off the toughest of grasses and/or weeds. However, for it to be effective this needs to be done in the hottest part of the summer. This method literally acts as a "sterilizer" for the covered area. You do NOT want to add compost to that area first, the worms are not going to hang around in that heated area. Once you have the area cleared, then add compost etc to the area. I also suggest you look up some sources for Probiotics, I'm in the States so doubt my sources would be of any help to you. However, I sure somebody makes probiotics or compost starter type products in your area. Adding this type of microbial life to your gardening area will greatly increase your production and enrich your soil. We vermicompost and use a probiotic in the food we feed our worms as well as add it to our compost bins. We've been gardening this area for over 30 years using only organic methods,and adding the microbes have given the soil and additional boost. Makes sense, you need the microbes to unlock the nutrients in the soil, since they are living creatures, they will die off, so adding more makes a big difference. " "Thanks for all the replies, I have some black plastic maybe I should make some paths through this jungle with it and put some straw on top at least that way there may be some sort of definition added the really bad heavy clods or large tufts of grass with some soil attached I am heaping together in a sort of wall , I will cover this also during the hot weather and maybe it will act as a sort of wind break with some trees planted about 12 inches away from it this is evening up the hollow there nicely what do you all think, I have a word press journal entitled my garden challenge if anyone would like to see photos it would be great to get your advise https://kathymburke.wordpress.com/"
"https://kathymburke.wordpress.com/2015/02/15/valentines-day-from-the-garden-challenge/ the photos can be seen here if you copy and paste the link into your browser I think must try and learn how to make my links workable, all a work in progress like my garden challenge . Thanks for the previous replies really helpful." "Ruth Stout published a book in 1971 titled No-Work Garden Book. She was a regular contributor back then to Organic Gardening magazine. She grew everything under mulch. Vegetables and flowers. I have her book and she grew potatoes using her system. I mulch everything in my garden with shredded leaves, mostly maple. It works great but I have trouble with Voles as they eat at anything growing under ground - carrots and potatoes are the biggest victims. I am thinking of growing the potatoes this year on the soil and keeping plenty of leaf mulch on them. Does anyone know if this is helpful in thwarting the voles?" "Hi Madeline. I have no experience of voles and how to deter them, so I'd be interested to hear others' experiences too. Good luck growing your potatoes. I hope they come through unscathed and you enjoy a bumper crop." "I don't see any mention of what kind of potato s to plant. I have thought that you get cut up potatoes front the hardware store, called seed potatoes. Please clarify! Thanks!" "Steve," seed potatoes " are what you're looking for. There are many varieties available, just depends on what you prefer. In this area, most of the hardware stores and nurseries sell Kennebecs. A nice all purpose white meat spud that can be used in many different dishes. You can cut those apart leaving "eyes" in each piece. We roll ours in sulphur to avoid potato scab. That's a serious problem around here. Allow them to dry for a couple of days and plant. We plant ion the ground n a area we to which we have already added amendments etc. Cover with a layer of oak leaves and straw and water lightly. As the potatoes throw shoots we keep adding more leaves and straw, until the "shoots" stop growing. We top the bed with some old storm door screens we've rescued to help keep the leaves and straw from flying. " "I bought a 4 x 2 foot galvanized cattle stock tank, filled it with soil. It was on sale so I used dirt in a bag set my spuds with eyes on top of the soil and covered that with 6 inches of straw. We had the best potatoes with no digging. I drilled many holes in the tank to allow water to drain and I built a little clear fiberglass lid so I could start the potatoes early. So far this year I have plants 24 inches tall and blossoming. I'm ready for some parsley butter potatoes." "We're growing potatoes carrots onions garlic kale cauliflowers straws lettuce and others. We have an old paddock with overgrown grass. We put everything straight on the grass and spoiled hay over the top. We can plant earlier because a thick wedge of hay over some things keeps them protected. Potatoes can be given a covering of horse manure which reduces the alkalinity. Brassica get some pure matured wood ash for increasing alkalinity. We only dig when putting in trees and shrubs. All is working well considering that it's windy here! Hay doesn't blow around as easily as straw either. The hay seeds are kept under control easily by more hay on top. Underneath, the old hay is like soil and full of worms. We still get potato blight though! Soil/hay base is only exposed for seed sowing and gradually covered again. Feeds 3 adults with left overs to sell ! Ruth Stout method for truly lazy gardeners!n"
"Wow, that sounds like an awesome setup Sarah, thanks for sharing. It's great if you can product an abundance of crops with minimal digging - saves the back and the soil!" "Castor Beans (I grow them each year for the seeds), are a deterent for Moles and Voles. They are poison to eat and keep the population down. This year I plan to put them out for mice which try to come in and over winter indoors and see if that works too." "I hadn't realised that. That's a great tip - thanks for sharing." "I have moles that tunnel direct to my garden; I stop them by planting my garlic and onions on the perimeter. They don't like the smell and stay out of the garden. This also stops the rabbits. I start with a thick planting of garlic/onion for spring and then thin the plants out for summer. Also, a garlic spray on your lettuce will stop the rabbits and deer from eating it. In our community garden we were the only plot that the deer didn't eat the lettuce and beans etc.. There were deer tracks through our space but no garlic sprayed plants were eaten. (Hi Madeline. I have no experience of voles and how to deter them, so I'd be interested to hear others' experiences too.) "
"Hi Dianne. Interested indeed to learn of your methods for keeping unwonted visitors out. So much for Sarah, this is a really useful tip." "Hiya Helen, I had an Irish friend (He was the Earl of Mayo and unfortunately has passed away, bless him) who explained to me that in Ireland they had a method using plastic sheeting in a trench under the potatoes. When the potatoes were ready for harvest they would just lift something off and the potatoes were there without having to dig.. We'd obviously had to many whiskys together and I can't fully remember what he had explained.. Does this sound like anything that you have heard of? Thank you, Simon"
"Someone said that she planted onions and garlic around the perimeter of her garden and that kept everything safe from the Voles. My response is that the Voles ate the onions, and garlic, and the carrots, beets, and potatoes and that I had to pull/harvest all the root crops early in order to have any at all for myself. I had what is called an irruption, an unusual population explosion of Voles in 2017. I tried pepper flakes, woodstove ash, ammonia, commercial repellent, all to no avail. The Voles basically ruined my 2017 growing season, and they are still there. Just yesterday I discovered that the Hostas have been attacked. Most of their roots are chewed off. My 3,000 square foot garden is fenced to keep deer and woodchucks out, but I am defenseless against the Voles. I am in northwest New Jersey, USA." "Hi Simon. I've not heard of that method before - it does sound like it saves digging though. I guess if you did line the planting trench, so you could pull the whole growing matter that the potatoes are growing in out when they're ready, you'd need to make sure that there was adequate drainage. The plastic could collect water and cause the tubers to rot." "Hi Madeline. It does sound like a total nightmare, what a shame. Short of covering every plant with chicken wire I'm not sure what else you can do to defend yourself against the voles - it seems like you've tried everything else. Bonnie Plants has written a useful article about keeping voles out of the garden. I can't give web links in the comments section, but if you search online you should come across it. Good luck - I hope you win the war eventually! " "I grow both sweet potato's and red potato's here in Louisiana using this method. Generally purchase 1 bale of hay to get started then afterwards grass clippings which have laid out in the sun on concrete for a week or longer. Pecan tree leaves are perfect mulch and I use wood ash also. Haven't bought a potato in 2 decades." "That's fantastic Jay - how satisfying to be completely self-reliant on potatoes!" "Hi, just tried no dig as an experiment, but not greatly successful. We didn't water, and we live in a Australia so it can get pretty hot. Some places say to water no dig potatoes, some say don't. Maybe it depends when you plant them. Any ideas? Thanks :)"
"Yes, I would say in any hot, dry climate you would definitely need to water your potatoes as they are thirsty plants." "Just re-read all the comments in this section and would like to add a comment or 3. I continue to pile straw and mulch until it reaches 4 feet high. Have harvested potato's at the 2 foot level. As the plant pokes thru, add a few inches more. Never let the plant exceed 6 inches above the straw. Perfect use is old grass clippings and chopped tree leaves. I have been known to mow a neighbors yard in the fall just to harvest accumulated tree leaves. Time to harvest ? After the flowers die and the plants wither, continue to water well and wait 2 weeks. This is the time the main crop spuds are growing larger. After this 2 week period post plant wither, make your harvest laying out all the new very thin skin potato's. Do Not Wash them instead lay out in a secure open area to allow the skins to thicken. After this they should be good for up to 3 to 4 months stored properly. Immediately begin treating your base soil, combination of 50 50 compost and manure. Re Use the old straw and old compost tilling back into the soil of the other planter boxes. I am a believer of tilling soil and do so at a depth of 9 inches. After a few years, my soil is a black loam, very loose which allow oxygenation and almost weed free. I am over 3 decades using raised planter boxes and supply not only myself but friends and neighbors every year. This makes me a popular neighbor. "